Jake Cassidy will return to Wolves at the end of his loan spell at Tranmere in January, so that the Championship club can assess the striker's progress. 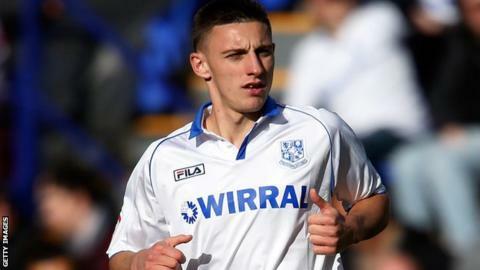 But Rovers manager Ronnie Moore has revealed Tranmere have first option on any future move for Cassidy. The 19-year-old is the top scorer in League One with 10 goals this season. "Jake's due to go back on 6 January and he will definitely go back because they want to take another look at him," Moore told BBC Radio Merseyside. "If they're going to let him out again, we'll have the first option on it. "If they take him, they take him. I still think he needs another five months with us, and by the time he's finished with us he won't be too far off being a really good Championship player. "He's learned a lot since he's been here. "We've definitely progressed Jake as a player and he'll go back to Wolves a better player than when he came here, that's for sure." Cassidy and Sheffield Wednesday midfielder Liam Palmer have been refused permission to play in Sunday's FA Cup tie at non-league Braintree. After Tranmere's last Saturday, Moore said he who is yet to make a first-team appearance for Wolves, for the remainder of the season. Cassidy enjoyed a successful loan spell at Prenton Park at the end of the 2011-12 campaign, scoring five times in 10 appearances. And he has continued his excellent form this term, helping Tranmere rise to the summit of League One. Meanwhile, another on-loan striker, Nathan Eccleston, has returned to Blackpool for treatment on a hamstring injury, which will rule him out of action for up to three weeks.